Using friendly bacteria, ProBio Daily`s powerful probiotic bacteria helps keep the intestinal flora `sweet`, and maintains its regularity. Unlike many probiotics, Bacillus Coagulans survives stomach acid well because it is in `spore` form. ProBio Daily is also very useful in supporting the body during and after antibiotics and when exposed to contaminated food or drink, especially when travelling. ProBio Daily`s bacteria are less affected by heat than most probiotics. As refrigeration is not necessary it can be taken in a suitcase and will travel anywhere. One tablet conains 150 million bacteria, a level determined by scientific studies – any mMore than this is not necessary. 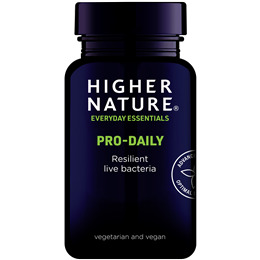 Probiotics are dietary supplements containing potentially beneficial bacteria, these are similar to foods which may contain probiotics `with live cultures`. Probiotic bacterial cultures could help support the body`s naturally occurring flora within the digestive tract. They are sometimes recommended by doctors, and, more frequently, by nutritionists, after a course of antibiotics. Research suggests that probiotics may help support the immune system. The rationale for probiotics is that the body contains a miniature ecology of microbes, collectively known as the gut flora. * In the order of 150 million bacillus coagulans at the time of manufacture. Bulking agent: maize maltodextrin; fructo-oligosaccharides, bacillus coagulans, hydroxypropyl methylcellulose coating, anti-caking agent: magnesium stearate*; vanilla flavour (sweetener: sugar; anti-caking agent: silicon dioxide); glycerine*. Adults: Take 1 tablet up to 3 times a day, with meals. Children over 8 years: Take 1 - 2 tablets a day, with meals. 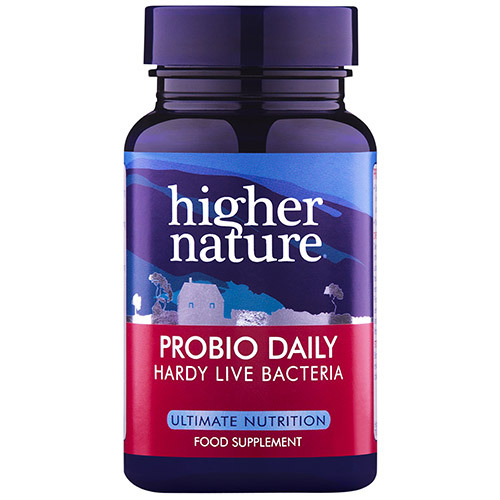 Below are reviews of ProBio-Daily - Hardy Live Bacteria - 90 Tablets by bodykind customers. If you have tried this product we'd love to hear what you think so please leave a review. Very pleased with the pleasant at staff at Bodykind. Will continue to use them in future. I have only started taking the probiotics but my has taken them for a long time. This stuff has been a godsend in alleviating my problem of extremely smelly flatulence due to a chronic bowel condition. ProBio’s powerful probiotic bacteria helps keep the intestinal flora at optimum levels and this helps to support and maintain your digestive function. Suitable for vegans.